The voting for Madhya Pradesh and Mizoram Assembly elections has concluded. Both the States recorded around 75 per cent voting. BJP leader and Madhya Pradesh Chief Minister Shivraj Singh Chouhan and Congress leaders Kamal Nath and Jyotiraditya Scindia were among early voters. Around 1,145 EVMs and 1,545 VVPATs were found to be faulty in Madhya Pradesh and had to be replaced, while three Election Commission's polling officials died from cardiac arrest. The Congress is trying to wrest Madhya Pradesh from the three-term holder Bharatiya Janata Party (BJP), while in Mizoram, the BJP is hoping to break the ground and play the kingmaker, if not the king, by supporting regional parties in today's election. The battle of ballots in Madhya Pradesh and Mizoram is just months ahead of the Lok Sabha polls slated in the first half of 2019. 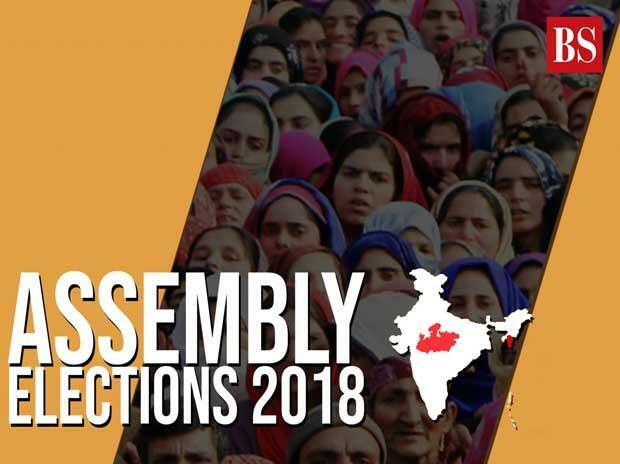 Results of the Assembly polls 2018 will be declared on December 11. MP is voting to elect a 230-member Assembly, for which as many as 2,899 candidates, including 1,094 independents, are in the fray. BJP is contesting all the 230 seats, while the Congress has fielded 229 candidates, leaving one seat, Jatara in Tikamgarh district, for its ally -- Sharad Yadav's Loktantrik Janata Dal (LJD). Chief Minister Shivraj Singh Chouhan, in office since 2005, is seeking re-election from Budhni in Sehore district. The BSP has fielded 227 candidates, while the SP is contesting on 52 seats. The Aam Aadmi Party (AAP), contesting the Madhya Pradesh elections for the first time, has fielded 208 candidates. Elections to the 40-member Assembly in Mizoram, which has a population of about 1 million, is significant for the BJP, which considers it to be the 'final frontier' in the region. The Congress and the MNF have fielded 40 candidates each, while the BJP is contesting in 39 seats. The Zoram Peoples Movement (ZPM), an alliance formed by two political parties and four groups, is contesting in 35 seats. Today's pollings were marred by complaints of faulty Electronic Voting Machines (EVMs) and Voter Verifiable Paper Audit Trail (VVVPAT) machines. Poll officials said 1,145 EVMs and 1,545 VVPATs were replaced after complaints of technical snags. Congress leaders claimed that EVMs at many places had malfunctioned. BJP has moved the Election Commission against Congress leader Kamal Nath for an alleged violation of the Model Code of Conduct by showing his hand- a symbol of the Congress party- after casting his vote in Chhindwara today. However, Nath, while speaking to ANI, said: "I had already cast my vote. When people asked me when those from media asked me whom I have voted for I showed this (palm). What else could have I done? Show a lotus?" Back-to-back firing incidents took place in Bhind city of Madhya Pradesh. Sources said the incident took place in the Raipura area of Lahar state asembly seat. Police managed to arrest three suspects.Few tried to destroy EVMs in lahar constituency of Bhind district. Despite tall claims of security measures, many attempted to destroy EVMs and VVPATs during the polling at booths. Three EC officials die due to cardiac arrest during Madhya Pradesh assembly voting process. One death was reported from Guna and two from Indore. Three polling officials, including two presiding officers, in Mizoram's Lunglei district were removed from their duties after they were allegedly found in an inebriated state. The three officlas, who were found drunk, were removed from the election duties with immediate effect and authorities concerned were asked to initiate departmental enquiries against them. Congress leaders had earlier in the day, demanded that the Election Commission should have had compensated for the time wasted in replacing faulty EVMs and VVPATs by extending the polling time in concerned booths in Madhya Pradesh and Mizoram. Tribal refugees vote in Mizoram polls Amid prolonged uncertainty over return to their homes, Reang tribal refugees, sheltered in Tripura for 21 years, voted in large numbers in the Mizoram Assembly polls today. North Tripura district officials said around 60% of the 12,018 voters among over 35,000 tribal immigrants after travelling around 50-60 km had cast their ballots at Kanhmun, a village along the Mizoram-Tripura border. Around 73 per cent votes were cast in the Mizoram assembly polls today but the figure is expected to rise as there were long queues of voters outside polling booths to exercise their franchise, Chief Electoral Officer said. Around 60% voter turnout recorded in Madhya Pradesh's naxal hit areas According to reports, voting has concluded in Naxal-hit areas of Madhya Pradesh. Over 60 per cent voter turnout was recorded. 66 per cent, 64 per cent and 68 per cent polling was reported from the Maoist-affected Baihar, Lanjhi and Paraswada constituencies respectively. Voting for these seats closed at 3 pm.